Rickie Smith drove to victory Sunday during the NHRA Pro Mod Drag Racing Series Gatornationals at Gainesville Dragway. 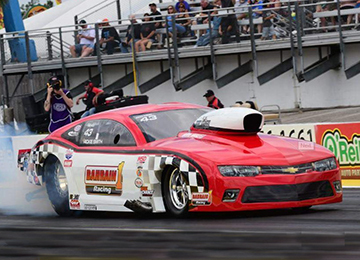 This weekend's Pro Mod racing, presented by Jerry Bickel Race Cars, is the first of 12 events this season. Smith ran a 5.794-second pass at 249.76 mph in his Chevrolet Camaro to take down Mike Janis in the final round and earn his first victory since Englishtown in 2017 and the 12th of his career. Smith defeated Bob Rahaim, Jim Whiteley and Mike Castellana on his way to the win. "To be able to come out here after not having a sponsor all winter and not knowing what we were going to do this season and then end up getting a win in the first race is really special," Smith said. "I started winning championships in 1976, and to keep winning races at this age is just unreal." The Fuel injection, Ignition and Nitrous systems are all controlled by the EFI Technology XTR ECU.